New research published in BMJ Open suggests that people over the age of 50 who are healthy, active, sociable, and wealthy have a greater risk of harmful alcohol consumption. The study analyzed survey responses of 9,251 adults 50 years of age or older who were part of a 2008–2009 and 2010–2011 English Longitudinal Survey of Ageing (ELSA). For the survey, participants were asked about their weekly alcohol consumption and a number of factors that influenced their drinking habits. Such factors included marital status, caring responsibilities, educational attainment, smoking status, diet, physical activity levels, loneliness and depression, self-reported health, employment status, and social engagement. Results from the survey indicated that for men, the risk of harmful drinking increased in their early 60s before it fell. However, for women, the risk of harmful drinking reduced as they began to age. Women with a higher income were at a higher risk of harmful drinking compared to those with a lower income; for both men and women, good health, smoking, and higher education were associated with greater risk of harmful drinking. Researchers further discovered that men who lived alone had a higher risk of harmful drinking, including those who were separated or divorced. Women who were retired had a higher risk of harmful drinking, although “caring responsibilities” were found to reduce the risk of harmful drinking for women. Iparraguirre, J., “Socioeconomic determinants of risk of harmful alcohol drinking among people aged 50 or over in England,” BMJ Open July 22, 2015, doi:10.1136/bmjopen-2015-007684. 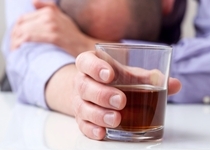 Whiteman, H., “Study links successful aging with greater risk of harmful drinking,” Medical News Today web site, July 24, 2015; http://www.medicalnewstoday.com/articles/297159.php.